Another month, another enormous desktop replacement that threatens to break the fragile worktops in the our labs clean in half, Eurocom have released the D900F Panther Core i7 laptop. 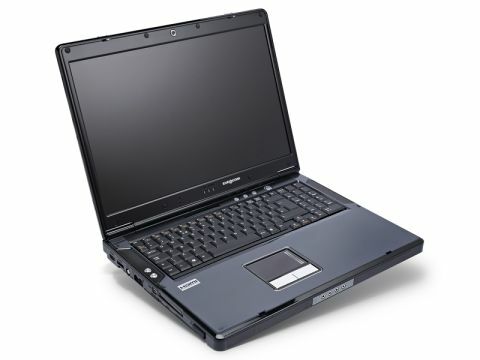 This time around, the 17-inch Clevo chassis that we've become familiar with over the last few months is inhabited by some hot hardware from Eurocom. Just like the very similar Novatech X90, the standout spec here is the CPU. The machine may be as lithe as a T42 battle tank on the outside, but inside it's a souped-up dragster that's raring to go. The CPU is an undiluted desktop Core i7, and it's hard to open up Device Manager and see eight cores (four plus four HyperThreads) registered as running without feeling a little closer to geek heaven. Cramming the top of the range i7 975, capable of overclocking itself, into a notebook might seem a little like overkill, but it makes for a good headline. Realistically, though, if you're thinking of buying a D900F, you're probably best off using Eurocom's configurator to build one around the more modest 920 variant – you'll save yourself a cool £808 in the process. The machine we're reviewing, though, has been kitted out with best-in-slot tech wherever possible. Graphics are provided by Nvidia's GTX 280M GPU – which makes gaming on the sharp, bright 1920x1200 screen as smooth as on most high-end desktops – while three hard drives of varying size are strung together to optimise just about every loading time possible. A single 80GB SSD blasts through the boot times, while two 500GB drives are conjoined as a striped RAID array to provide a terabyte of storage with ludicrously low access times. Now we're so accustomed to the weight of notebooks built into this chassis and their appalling battery life that we won't rehash the points here. As long as you're aware that this is a PC for moving around the home to, say, watch Blu-ray movies in bed rather than a laptop to carry on the train, we've no objection to the desktop replacement per se. If you want one of these binary behemoths, though, the Panther isn't the one to choose. The huge asking price – you can buy a dual-Xeon professional workstation for a similar amount cash – can be reduced by opting for more realistic components, such as a single hard drive and a Core i7 920. Even so, the physically identical Novatech X90 is cheaper. We've deliberately refrained from calling the machine value for money, but it certainly costs less. But time is running out for both machines. Any day now, new Core i7s and Core i5s will arrive, including dedicated mobile parts capable of running just as fast as the 975, but at a third of the thermal design power. That means lighter laptops, better battery life and uncompromising performance are just around the corner. In turn, our advice is to hold off on a new gaming laptop until then.